Kick off your visit on the 1st (Sat): contemplate the long history of San Juan National Historic Site, then take an in-depth tour of Cathedral of San Juan Bautista, then stop by Spicy Caribbee, and finally appreciate the extensive heritage of Old San Juan. On the 2nd (Sun), you'll have a packed day of sightseeing: take a peaceful walk through The El Yunque Rain Forest. To see traveler tips, where to stay, and tourist information, use the San Juan travel planner. Plattsburgh, USA to San Juan is an approximately 14.5-hour flight. The time zone difference moving from Eastern Standard Time to Atlantic Standard Time is 1 hour. While traveling from Plattsburgh, expect somewhat warmer days and much warmer nights in San Juan, ranging from highs of 87°F to lows of 76°F. Finish up your sightseeing early on the 3rd (Mon) so you can catch the flight to Culebra. Start off your visit on the 3rd (Mon): enjoy the sea views from Culebrita Lighthouse and then enjoy the sand and surf at Flamenco Beach. On the 4th (Tue), you'll have a packed day of sightseeing: kick back and relax at Tamarindo Beach, then enjoy the sand and surf at Zoni Beach, and then kick back and relax at Playa Punta Soldado Beach. For reviews, where to stay, more things to do, and more tourist information, go to the Culebra trip builder. Culebra is very close to San Juan. 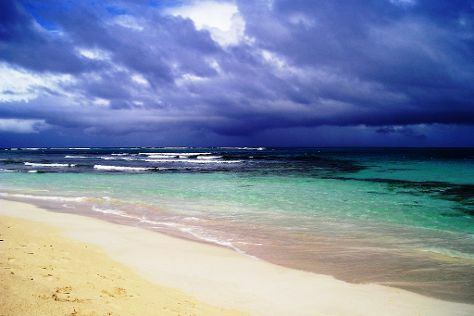 In June in Culebra, expect temperatures between 88°F during the day and 79°F at night. Finish up your sightseeing early on the 4th (Tue) so you can travel back home.